This companion book to TOO MANY FROGS is out of print, but both new and used hardcover and Scholastic paperback copies can still be found on-line via Amazon.com and others. A stage version, with my original title WHAT A DAY!, is now available from YouthPLAYS as a Readers Theater piece that can also be developed into a full production for young actors and audiences. See more at https://www.youthplays.com/play/what-a-day-by-sandra-fenichel-asher-509. I also have a few new hardcover copies available. If you’d like one personalized and autographed, please e-mail me at sandyasher@gmail.com. A Readers Theater script is also available on request to teachers and librarians, at no charge. It’s Grandpa’s birthday, and Froggie can’t wait to give him his present. But first he has to make the costume . . . and build the stage . . . and create the programs . . . then, it’s finally time to sing his song! What a performance! What a party! But then it’s all over, and Froggie wishes it weren’t. He’s been waiting for this day for so long—how can it end so quickly? 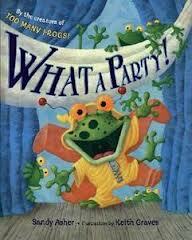 From the team who brought us the wildly popular Too Many Frogs! comes this simple story all children will recognize about the buildup and letdown of a big day—and the surprising things that comfort us when all the excitement is over.